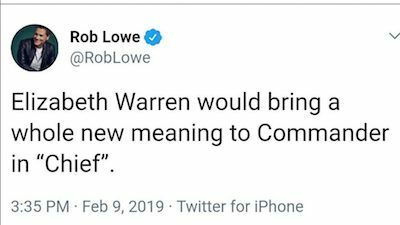 Rob Lowe apologized for this tweet. Does he actually care what the people who would be faux offended by this think? 8 Comments on Never apologize! Hey Rob, a little bit of criticism from thin skinned crybabies and you delete a tweet that had a little humor in it? And you rightfully poked fun at a person that deserves it.Jeez, what a bunch of crap. He went off the Reservation and had to pass the peace pipe. C’mon, you have to admit that there was one thing he needed to apologize for: that was a really weak joke. Is the ONLY appropriate response. Saw a promotion on the teewee, he’s the host of a new game show called mental samurai premiering soon. I’d say he’s toast anyway, the apology won’t help him. Reminds me of the story circulating on the Web about Lizzy’s grandmother.